Sorry I've been absent, but I've had a home invader in the form of a little brother. We've been working out some issues, but he's really cute and hard to stay pissy at. I'm sharing my pink bed with him while he can still fit in it. 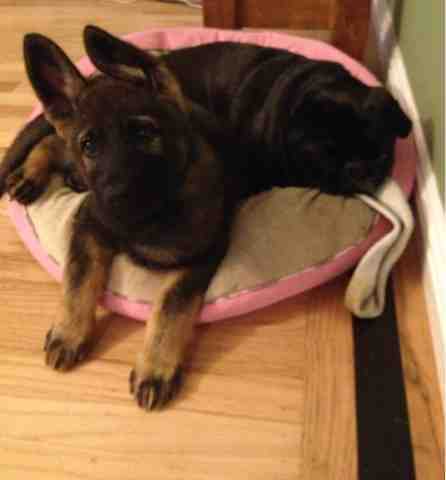 You two look like best buds already! Belly, he looks really sweet - we hope you overlook his overzealous puppiness. He will be a worthy minion for you. We must say, his ears rock! Yep, it looks like little (for now) bro is growing on you. ah he is really cute....so he is staying? Oh my gosh, Belly, he is already too big for the Belly Bed!!!! Lil' Sis, BIG Brother, or Big Sis, BIG Brother?